Employment Growth of Biopharmaceuticals, Medical Devices, & Health Services Industry Cluster | Propel L.A. 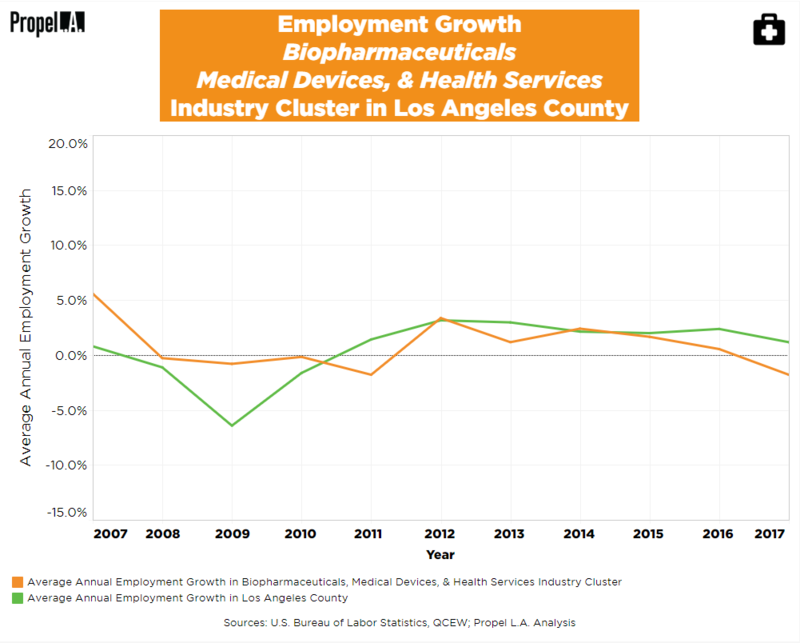 The Los Angeles County’s Biopharmaceuticals, Medical Devices, & Health Services industry cluster (“Bio”) has experienced a declining employment growth over time despite positive growth in some years, including 2007 and between 2012 and 2016. The green line represents the average employment growth of the whole County, irrespective of industries or clusters. Any rate below 0%, even if greater than the previous year, still indicates a decline in employment. Despite the decline in Bio employment growth in the region, Los Angeles County is reversing this trend namely through infrastructure and workforce development. In the last 15 years, homegrown startups have chosen their headquarters outside of Los Angeles due to the region’s lack of infrastructure and facilities and subsequently created new jobs in outside regions. To secure employment growth here in Los Angeles, USC is planning to construct a Biotechnology Park adjacent to the Health Sciences Campus in Boyle Heights that “will provide space for established companies, training for entry-level jobs, and incubators for start-up firms” (Los Angeles Times, February 2015). In addition, the Center of Excellence located in the LAEDC is planning community college curriculum to match our Bio industry cluster’s critical workforce needs. For more information, check out a presentation on this topic here. Annual employment growth was calculated by dividing the change in number of employees between two consecutive years by the number of employees in the preceding year within all he selected NAICS industries. Calculations only account for private ownership. NAICS industries were selected by using the definition of the industry cluster produced by the Cluster Mapping Project (CMP) developed by the Harvard Business School. Due to large population size of NAICS industries in the Bio cluster, Propel L.A. selected five through random sampling to represent this particular cluster. The summary of results may be slightly biased due to the NAICS industries being nonexhaustive. To learn what is the Biopharmaceuticals, Medical Devices, & Health Services industry cluster or an industry cluster, read here.